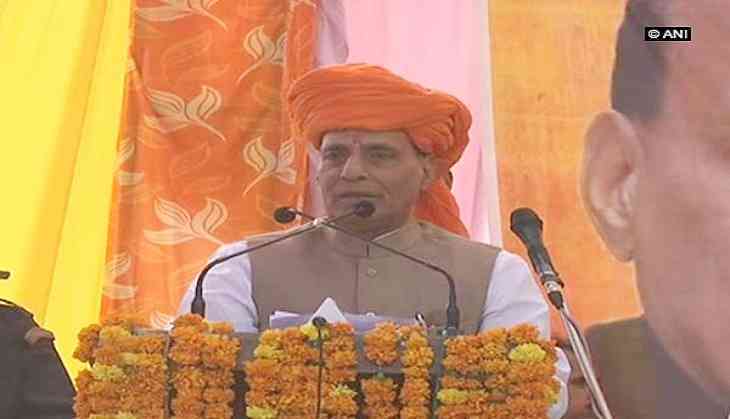 Union Home Minister Rajnath Singh on Monday targetted the Congress in his assessment of Himachal Pradesh's development, and said that a state's development vanishes wherever the Congress forms the government. "Wherever the Congress forms the government, development vanishes," Singh said, in a public rally at Himachal Pradesh's Kunihar. In the run up to the assembly elections, Singh expressed confidence in the Bharatiya Janata Party (BJP) candidate from Arki constituency, Ratan Pal Singh, who would be pitted against Chief Minister Virbhadra Singh from the Congress. Continuing his criticism of the Himachal Government over the development in the state, Singh claimed that the BJP-governed states had shown a visible growth in comparison. "Anyone can see the growth in the BJP-governed states. The situation of Chhattisgarh and Jharkhand have changed rapidly after the BJP came," Singh said. "Even the international agencies that regularly review the work of political parties have admitted in their review of India that if there was any political party whose government has shown efficient work, it was the BJP," Singh added. "The whole world and the World Bank are now recognising that our economy is one of the fastest growing in the world," the Home Minister added. Singh also enumerated the works of the Narendra Modi-led Government including the Prime Minister Jan Dhan Yojana, LPG gas cylinder subsidy, and the Mudra Yojana among others. Terming the much-debated note ban as a beneficial step for the nation as a whole, Singh contended that the inconvenience caused to individuals was for the sake of the nation. "Some people may have been inconvenienced, but imagine how much the nation was benefitted because of it," Singh added. The Himachal Pradesh Assembly elections will be held on November 9 and the result will be declared on December 18.